See the Ghostbusters reboot movie trailer? With over 800,000 YouTube dislikes, it’s been deemed by some to be the most loathed ever. While valid concerns exist over resetting such an iconic and profitable franchise, the outright hostility towards this particular reboot seems to stem directly from its all female cast. Om Edibles is like the new Ghostbusters of the medical cannabis world. Run entirely by women, the collective offers an extensive line of all-natural and, in some cases, spiritually-minded, products. Whether it’s the greater open-mindedness of mmj enthusiasts or just the nature of the industry, there’s been little open hostility towards Om, aside from some grossly inappropriate YouTube comments—but when have their comments ever been civil? In fact, the media response has been overwhelmingly positive, with in-depth video profiles produced by Vice and High Times. These reports focus largely on the radical nature of Om Edibles’ mission, and rightfully so, considering what they’re doing is fresh and exciting. But how do the cannabis infused products themselves hold up? Is Om Right for You? 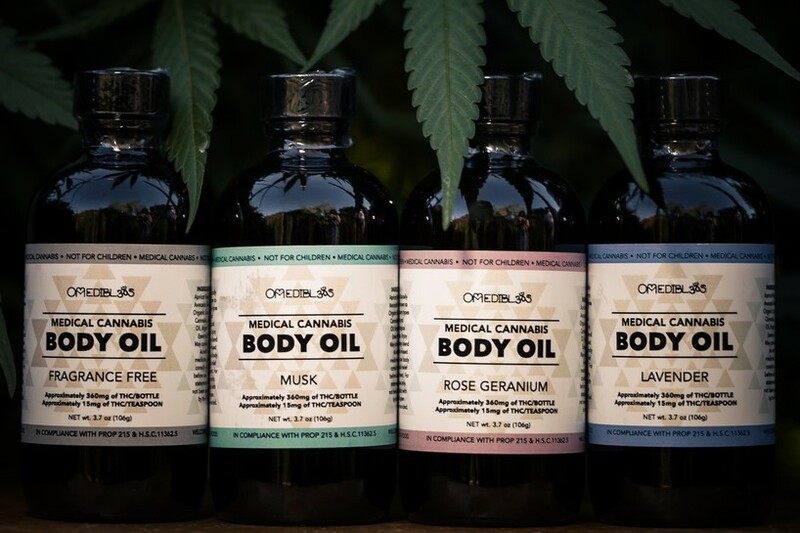 Nearly all of Om’s products have won awards, from the High Times San Francisco Cup to the Jamaica High Times World Cannabis Cup, where, in 2015, their biblical anointing oil was awarded first place in the “Best Topical” category. 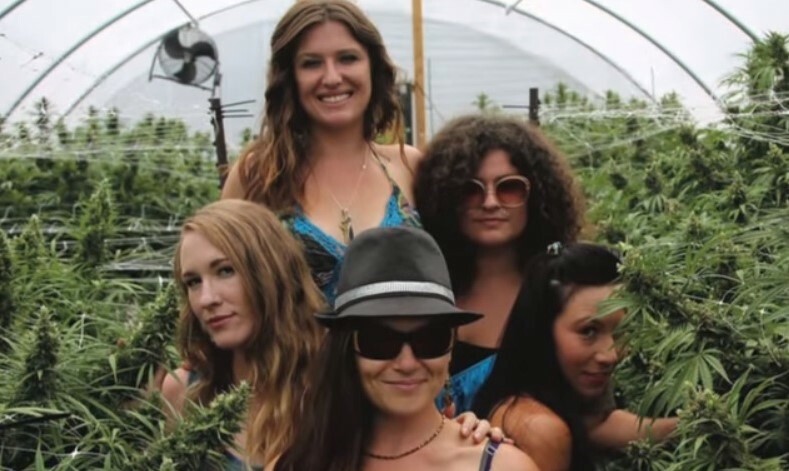 Though some of the concepts behind their products might sound gimmicky, at the core these awards are a reflection of the world-class cannabis strains grown and cultivated by this dedicated female collective. For a comprehensive guide to getting the most out of Om’s line or products, check out company owner Maya’s guide to relaxation. You’d be hard pressed to find a more compassionate and caring caregiver than Maya, who, along with running Om Edibles, acts as the company spokesperson. 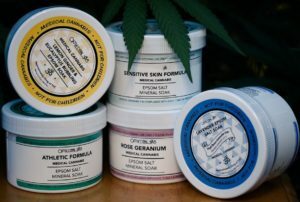 Now that you know a bit about the ladies behind the company, let’s meet Om Edibles unique and all-natural products, beginning with their topicals. 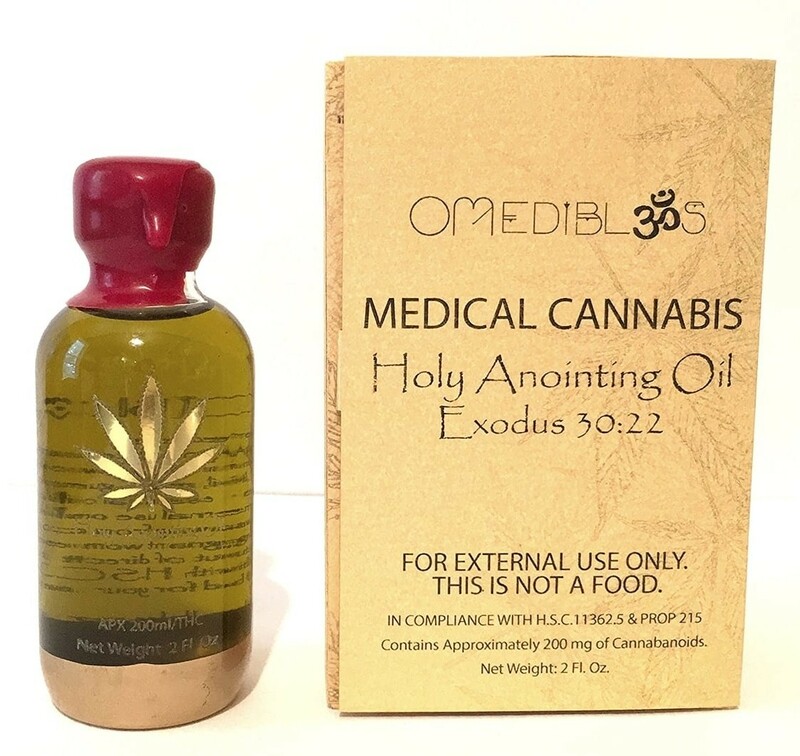 For the few who’ve been asking for a medicated holy anointing oil, we’ve got good news: Om has you covered. Their recipe even comes straight out of the Bible and contains 200mg THC in each ($20) bottle. Though use of this ancient product is pretty limited, it’s a testament to Om’s inspiration and creativity. Om Edibles also makes infused body oils derived from argan oil (beneficial to hair and skin) that can be applied directly to your body or added to your bath. Available in Lavender, Rose Geranium, Musk and Fragrance-Free with 100mg THC in every ($35) bottle. 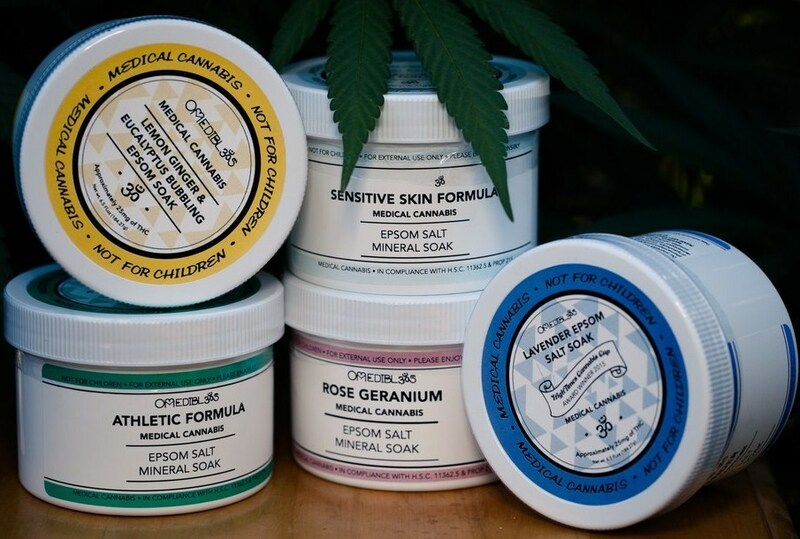 Though cannabis hydrotherapy is seldom explored, Om’s medicated Epsom salts add another layer of soothing relief to an already naturally healing product. Add them to a hot bath or soak individual limbs to get relief from aches, pains, insomnia, depression and skin irritations. These salts contain 25mg THC per ($12) jar in five aromas: Lavender, Lemon Ginger & Eucalyptus, Rose Geranium, Athletic and Sensitive Skin. Want cannabis’ medical effects without the high? Based on Tiger Balm, a popular topical pain reliever, this alternative contains beeswax, shea, cocoa butter and, of course, medical marijuana. Simply rub it on aches, bruises, skin irritations (but avoid open wounds)—practically anywhere you feel pain—for fast, effective results. You can find the balm in 25mg (2oz) or 50mg (4oz) THC jars ($20 and $40) and in a 10mg (1oz) THC roll-on stick ($10). Ready to make your own infused meal or just experiment in the kitchen? 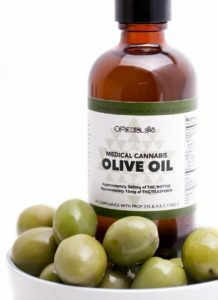 This versatile, infused extra virgin olive oil has a whopping 360mg THC in each ($30) small bottle, with 15mg per teaspoon. Drizzle on pastas, make salad dressings, use as a marinade—the cooking possibilities are almost limitless. Store in a cool, dry place and the oil should last up to a year, but we know it’ll be gone way before that! 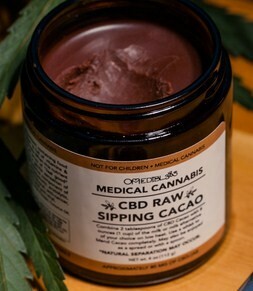 The idea behind this edible is that the CBD’s medicinal benefits will be enhanced by and work together with the raw cacao’s superfood properties. Cacao contains a chemical called anandamide, a cannabinoid thought to be responsible for the “runner’s high” that occurs after intensive exercise. The 80mg ($35) jar can be enjoyed on its own, used a topping or spread or heated and mixed with milk (it shouldn’t be heated over 115℉ to preserve all its health benefits). This is Om’s heaviest hitter, containing 175mg THC in each truffle ($10). 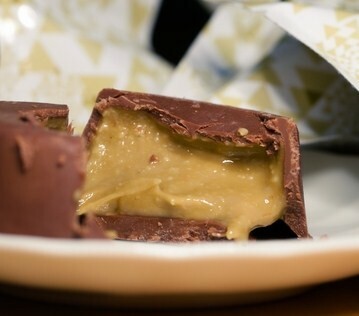 Medicated, organic peanut butter and puffed rice filling is enrobed by fine Belgian chocolate, getting medicinal and gastronomic bliss all at once! 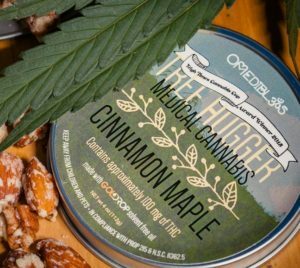 A gluten-free, paleo, vegan snack for the diet-conscious, a “treehugger” consists of a cluster of pecans, almonds and hemp seeds coated with sea salt, maple syrup, cinnamon, and vanilla; available in three strengths: 50mg CBD ($30) and 100mg ($20) or 300mg ($30) THC. A great pick-me-up, especially for those daytime outdoor adventures. 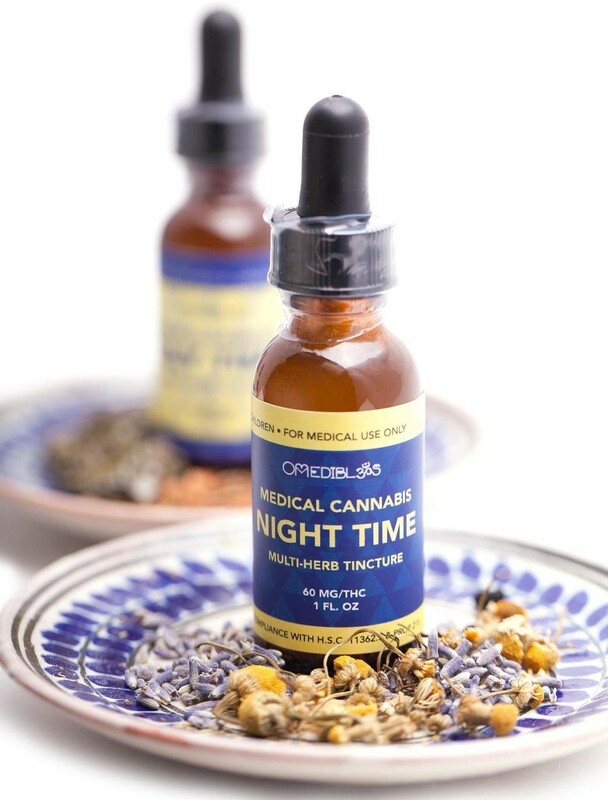 Om’s solvent-free tinctures contain raw, organic herbs that improve flavor and work in conjunction with cannabis. Their Elderberry 100mg THC is rich in vitamins and antioxidants, while the Day Time (ginger, echinacea, sativa hybrid) and Night Time (chamomile, lavender, indica hybrid) formulas contain 60mg THC and are ideal for their respective times/moods. There’s also a pure 50mg CBD version for those who don’t enjoy the psychoactive THC. Take them alone or add them to your favorite drink! All four sell for about $30. Is Om Edibles Right for You? Though Om Edibles offers edibles, topicals and tinctures unlike those made by other mmj companies, their benefits vary. 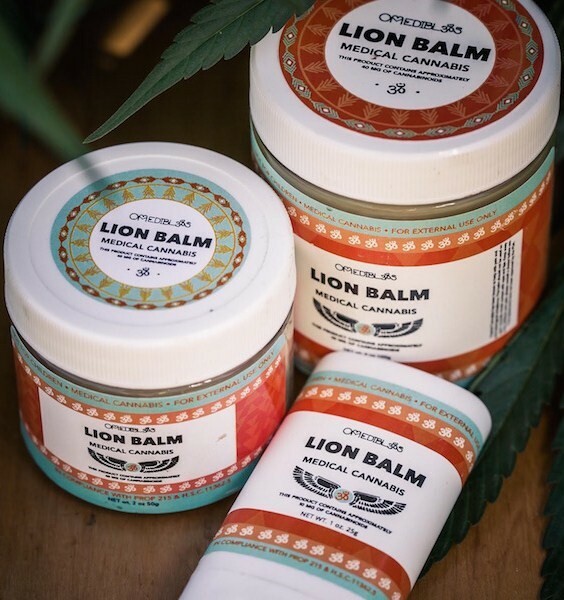 The Lion Balm, for example, will successfully reduce pain, but its effects are mild compared to other topical products that serve the same purpose. So it appears that patients with an existing interest in homeopathic medicine will get the most out of Om’s products. While this can be a bridge between some—more homeopathic medicine practitioners trying cannabis, and vice versa—it may put off an equal amount of potential customers who’d opt for something simpler and more effective. It should be noted that although it’s rooted in hundreds of years of history, few scientists comprehensively understand homeopathic medicine. The deciding factor may just be the compassion offered by the medical practitioner. Who knows? What is known is that Om understands how to combine homeopathy with medical cannabis to produce personal products with effective results. Though stronger alternatives exist, Om Edibles works. Considering that special care is put into making their products adhere to strict dietary restrictions using raw and organic ingredients, these may be the most effective options for patients who make these guidelines a priority. Only a few of Om’s edibles are considerably potent. Everything else has a mild and relaxing effect, which could appeal to new and elderly patients. Many dispensaries limit their range of Om products to tinctures and creams, so their stronger edibles may be hard to find. This is, of course, where Om Edibles shines. Their products are designed to smell great and soothe the body and soul thanks to high quality healing herbs and superfoods. Topicals can get expensive fast, but fortunately Om’s are affordable. A two ounce Tiger Balm jar runs about $20, while one of their tinctures is about $30. It’s not an insignificant amount of money, but compared to similar products these are affordable, effective, and a great entry point for new patients. You’ll find many reasons to use Om Edibles, some of which have nothing to do with the effectiveness of the actual products. If feminism is important to you, supporting an all-female collective may be enough reason to try one of their products. Likewise, paleo vegans may find their Treehuggers to be one of the few edibles adhering to their dietary needs. For everyone else, Om Edibles creates fun, affordable, high quality products that work just as intended. Whether you’re looking for an organic, superfood-based edible or just prefer your cannabis topicals derived from biblical recipes, Om delivers a higher level of quality. To them, each cannabis product is enhanced and medicinally more effective when combined with other ingredients and healing herbs. Practically no other cannabis company can make this claim.